What is this and why is it on my bill? In 2016, the Pulaski County Quorum Court passed Ordinance No. 16-0R-54 (and amended in 2017 with Ordinance No. 17-OR-50), also known as the “Voluntary Animal Control Spay/Neuter Tax,” which levies a voluntary tax of $5 or more to be paid by the taxpayer of his or her own volition. 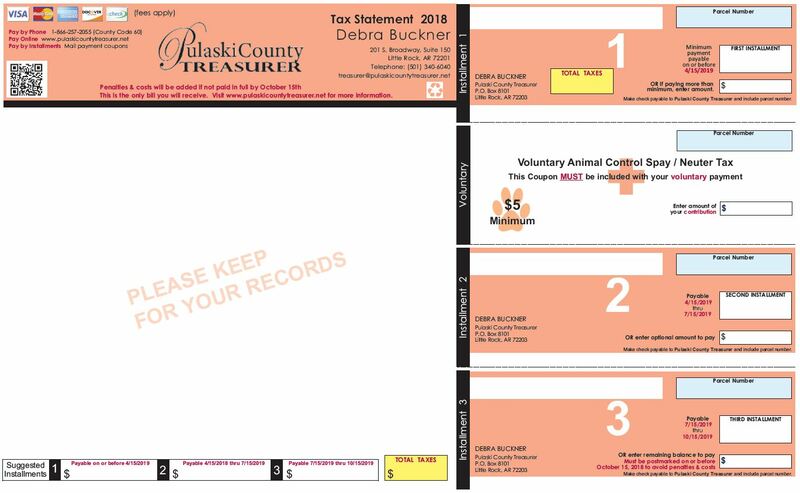 The ordinance was created for the support of Pulaski County’s efforts to manage its population of domestic pets and stray domestic animals. It is implemented by the County Treasurer’s Office and is completely optional. If you wish to pay the $5 or more voluntary tax, include the coupon labeled “Voluntary” from your tax bill along with an installment coupon. The option to pay is also available online, over the phone, or in person.